Get paid for your mobile traffic. Promote Mobile today! Our partners get to use our bannerless free host. No stealing of hits or 404s with endless popups...just clean, fast and free bandwidth. Don't be left in the dark. Our program not only gives you realtime stats for signups, raws and uniques but also provides you detailed refer stats too. Use our custom tools to generate content which blends in with your site's design and layout. All free signups that you send are tracked with your webmaster id for the lifetime of that user's membership. If a free member upgrades to a paid membership years later, you will still get credit. This is an excellent way to build long-term revenue. 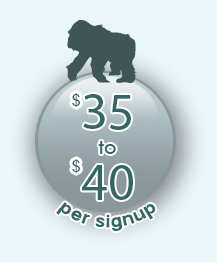 Sign up Today, and start marketing to the best personals on the web.